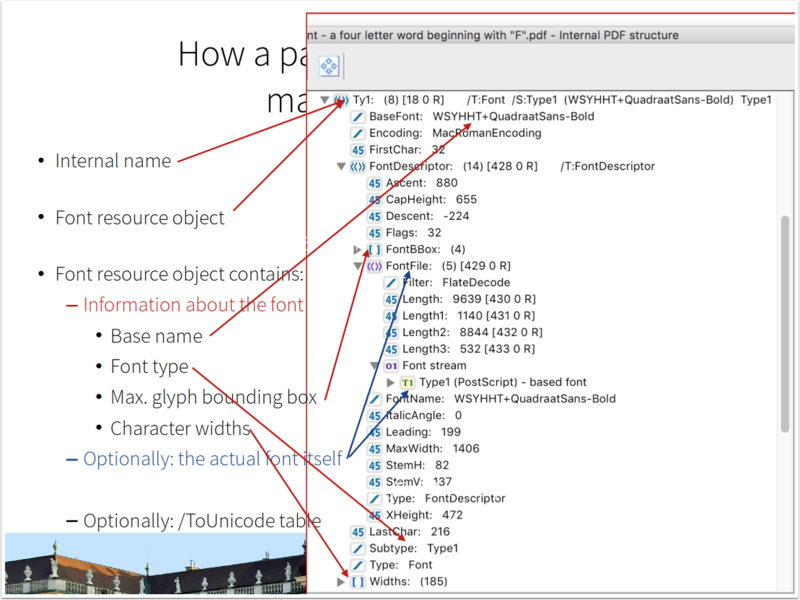 Full embedding – A full copy of the entire character set of a font is stored in the PDF. Subsetting – Only those characters that are actually used in the layout are stored in the PDF. If the “$” character doesn’t appear anywhere in the text, that character is not included in the font. This means that PDF files with subsetted fonts are smaller than PDF files with embedded fonts. Type 1: 20 years old hence ancient in technology terms. Type 1 fonts are not cross-platform. Type 3: Uses PDF drawing commands to define the glyph outlines. This font format allows greater flexibility over the appearance of the glyphs but does not include a hinting mechanism resulting in reduced visual quality for small text or low resolutions. TrueType: Outline fonts which means that they can deliver output at any resolution or size. Not required for displaying the page, but for text search or text copy.